In Colombia we have two versions of coconut rice. The white coconut rice that is a bit similar to the Thai version, and the coconut rice made with “titoté”. Titoté is what we call the burned solid coconut that ends up in the pan after the liquid from the coconut milk evaporates. This is what gives this rice such a sweet and savory flavor that goes so well with any kind of meat or fish. 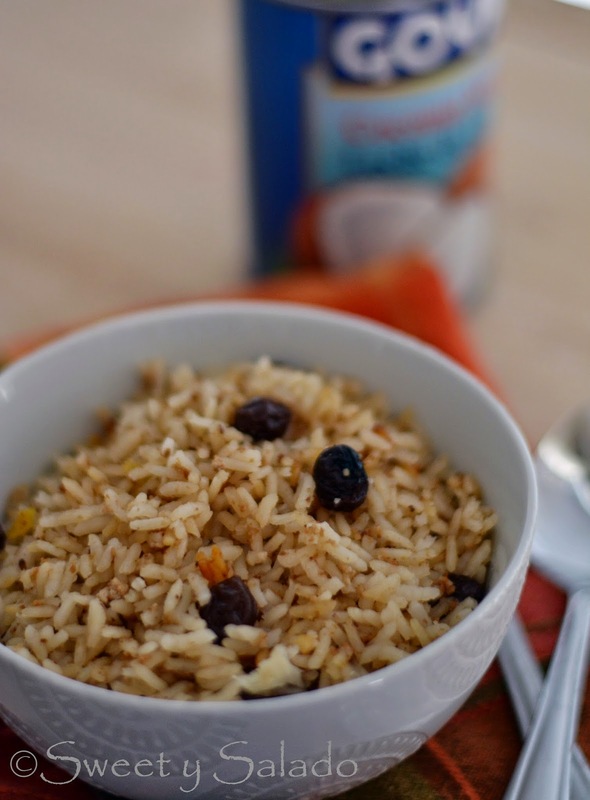 To make this rice I always use canned coconut milk because it’s the easiest way for me to get it. In Colombia they actually grate fresh coconuts to get the milk out of them but in all honesty, using canned coconut milk works just as well and it tastes the same, no matter what other people tell you. So, don’t feel bad if you end up using the canned stuff like I do. Just one word of caution, try not to use Asian coconut milk because I have noticed that those cans come with a thick layer of coconut on top that doesn’t work well for making this rice. Stick with Latin brands like Goya, which have more liquid and are easier to work with. Another piece of advice I have is just to be patient while making this rice because making the titoté takes a little bit of time, but you will see that it’s totally worth making. 1. Pour coconut milk into a large pan and bring to a boil on high heat. Once it is boiling, reduce the heat to medium low and cook, stirring frequently, until the liquid dissolves and the coconut solids turn a caramel color. This can take up to 40-45 minutes. 2. 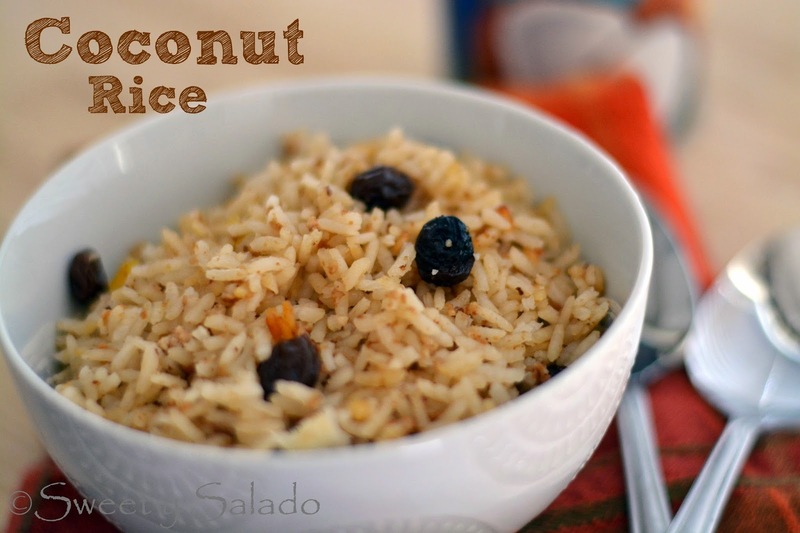 Add the rice and stir well with the coconut. Then, stir in the salt, sugar and raisins. 3. Add the water and the cola and bring to a boil on medium heat until most of the liquid evaporates. Then, cover and cook on low for about 15-20 minutes or until the rice is cooked through. Serve immediately. **Note: The water and cola can be substituted with 3 cups (720 ml) of coconut water or regular tap water. If I don't want to use the cola and water. Can I replace it with coconut milk making it a total of 6 cups of milk ? Yes, you would then need 6 cups of coconut milk total, 3 of those you would turn into "titoté", the brown coconut solids, and the other three would be the liquid to cook the rice with. Many people in Colombia only use the coconut milk from one coconut, so the last three cups are usually more watery since it's the last bit of squeezed milk they can get out of it. When I have to put in the water and coca cola can I use coconut water with the coke instead? Yes you can! Many people in Colombia only use the coconut water that comes from one whole coconut. The first couple of batches is pretty thick and white but the remainder cups are more watery but still have that coconut flavor.